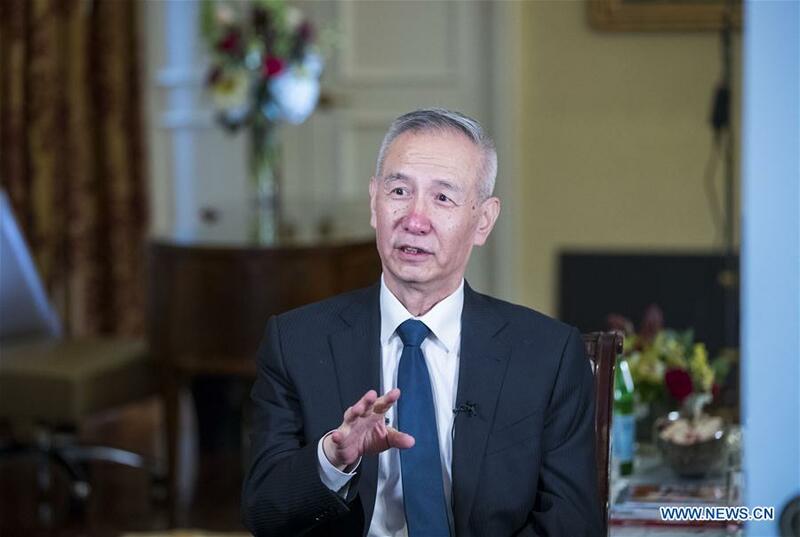 WASHINGTON, May 19 (Xinhua) -- Chinese President Xi Jinping's special envoy and Vice Premier Liu He said here Saturday that China and the United States have reached consensuses on economic and trade issues, pledging not to engage in a trade war. He told media in an interview on Saturday that the two sides agreed not to launch a trade war and to stop slapping tariffs against each other, which are the most remarkable fruits of the consultations. Noting that his visit to the United States is positive, pragmatic, constructive and productive, Liu explained that the most important reason for the achievements is the important consensus reached previously by Xi and his U.S. counterpart Donald Trump, and the fundamental cause is the needs of the two peoples and the whole world. The two sides will enhance their trade cooperation in such areas as energy, agriculture products, health care, high-tech products and finance, Liu said. Such cooperation is a win-win choice as it can promote the high-quality development of the Chinese economy, meet the people's needs, and contribute to the U.S. effort to reduce its trade deficit, he added. He underlined that China, with a large middle-income population, will become the world's largest market. The Chinese vice premier added that China welcomes all countries to attend the first China International Import Expo to be held in Shanghai in November this year. Liu also said that China will accelerate implementation of Xi's remarks at the Boao Forum for Asia Annual Conference 2018 earlier in April, when the Chinese top leader proposed to further China's efforts to facilitate the market access, build a more attractive investment environment, strengthen intellectual property protection and increase imports from other countries. The healthy development of China-U.S. economic and trade relations is in line with the historical trend, Liu said, adding that the two countries should properly handle their differences through dialogue and treat them calmly in the future, he said.